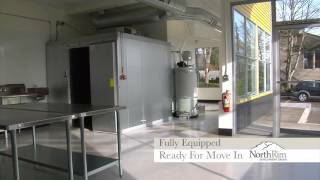 Production Kitchens	B 1,150 RSF *LEASED - Call for Availability* - Fully-Equipped Beaverton Kitchen just off Hwy 217 ~ For Rent Commercial kitchen space perfect for caterers, food-producers, wholesalers, and meal-delivery companies. Equipment includes: walk-in cooler, range, grill, oven, hood, work tables, & sinks. On-site parking & signage available.